Not too long ago, I took pride in always cooking “enough to feed an army.” Even as a single woman, living alone, I would always cook too much . . . In case I was extra hungry, wanted to bring some for lunch the next day, or a friend or neighbor dropped by unexpectedly. I also used this tactic since I never had a plan. I would look in the fridge to see what I had, and then just cook what I could with what was available. Cooking the way that I did, I would often over-eat. I ate a lot because I enjoyed the food and it was available, not because I needed it. Making a little extra food one or two nights each week can be a huge time-saver for particularly busy nights later in the week. Now that I have changed my thoughts around food (for the most part), I focus my energy around food on eating to fuel my body. I plan my meals out weekly and each week I go to the grocery store where I only buy what I need. Since there are only two of us, I am lucky enough that I don’t need to cook dinner daily. Typically, over the weekend I will prep our snacks and lunches, each day during the week I will cook breakfast, and dinner gets prepared once or twice per week. Most recipes make 4-8 servings. So, often, one casserole or soup will feed us both for most of the week. Then, I can freeze a couple of servings, too, for a later date. I love to portion out my leftovers so that each container holds just one serving. Since I have a freezer full of much healthier meals at home, I never need to buy pre-made meals from the frozen section. Plus, I know exactly what’s in each of my frozen meals. As if that weren’t enough, they’re a fraction of the price! This week happened to be one of those that I just needed the extra time. 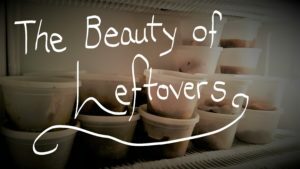 Luckily, the freezer was well-stocked, so we’ve been living off leftovers all week! It’s convenient and I can feel good about what I am feeding myself and my husband. I stumbled upon my favorite containers on Amazon. These bad boys are freezer safe, they stack well and they are the perfect size to hold one serving of just about anything. I put all my leftovers in these containers just in case plans change and I decide at the last minute to freeze something that I had originally intended to eat within a few days. By cooking more food, less often, the busiest nights of the week will be smoother-sailing! It’s easy to accomplish when you plan ahead and freeze your own leftovers. This way, you can avoid the frozen food section (or worse, fast food restaurants! ), and save the cooking for the nights when there is less going on. This strategy seriously helps keep me sane. Give it a try next week, and let me know in the comments what worked and what didn’t. Previous postHow to Get Your PhD . . . In YOU!